Keen to visit Australia next year and be part of the highlight of the Australian O-Calendar? 5 new maps, 3 World Ranking Events. Sprint, Middle, Long & Relay Australian Championships. All events open to orienteers regardless of nationality. Very easy to A-grade short courses available for the social orienteer. Outstanding gold mining terrain in Hill End Historic Site National Park, college/university campuses, spur-gully pine/eucalypt forests and complex granite rock. Touring around Bathurst and Hill End: steeped in mining, political, automotive and art history. Day and overnight tours: Dubbo Plains Zoo, Jenolan Caves, World Heritage Blue Mountains, Orange. 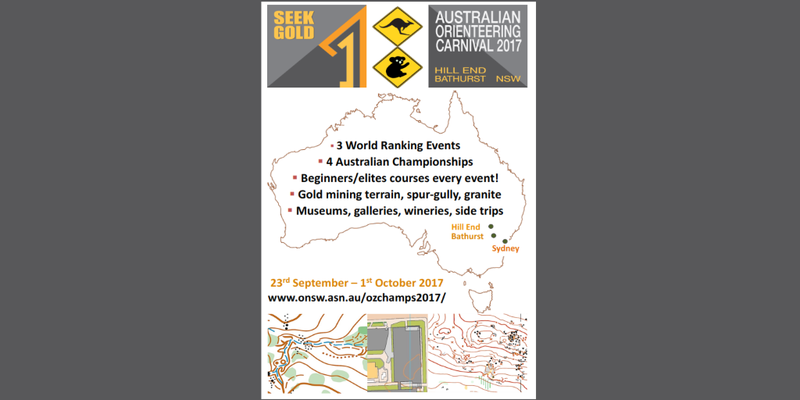 Several State Championships are on the weekends before our Aus Champs Carnival, and the Aus MTBO Champs are on the week after. Hence you can have a month of O in Australia!